The Gunpowder is clear, flowing at 127CFS and is 50.5 F. Thanks to Mike Colegrove for the Hendrickson pics and to Gene for the great stream report. Still knocking the dust off your gear? Please visit with him in the shop on Monday, Thursday and Saturdays to get the latest on River conditions. 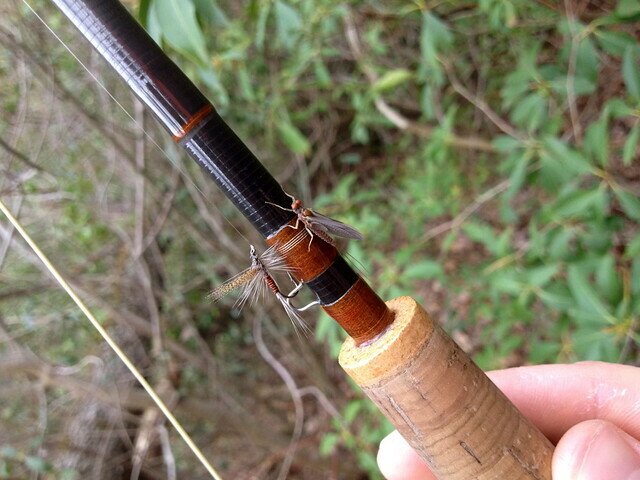 Red quills, emergers and tiny midge patterns have been the ticket-be sure to bring along some 6 and 7x. This April, variable weather conditions is resulting in equally variable flow levels on the Gunpowder, it’s always useful to check the water gage link during this time of year before heading out. Streamers are taking lots of fish at the moment, olive wooly buggers for crayfish and sculpins along white zonkers for the baitfish, both being particularly effective as water levels drop after a spell of spring rain. Black ‘snow’ flies, hook size 20, are reliably peeling off the surface throughout the day. Keep an eye out for Hendricksons and March Browns, especially closer to the dam above Falls road where the large rocks on the streambed provide optimum habitat for the nymphs to thrive. As water temperatures steady at 50 degrees there should be greater abundances of Hendricksons and heavy spinner falls occurring throughout the next two weeks. All patterns readily available in our muffin tins will put you onto wild trout in the catch and release section. Recently stocked rainbows are moving up from the stocked water and settling into the lower stretch from Bluemount Rd. downstream. This entry was posted in fishing report on April 11, 2016 by Theaux Le Gardeur.